Whaling in the Arctic waters off Alaska's coast was as dangerous as it was lucrative in 1897. In that particular year, winter came early, bringing with it storms and ice packs that caught eight American whale ships and about three hundred sailors off guard. The ships were imprisoned in ice with no hope of escape. With limited provisions on board the ships that hadn't been crushed by the ice, there was little hope that these men could survive until warmer temperatures arrived at least ten months later. 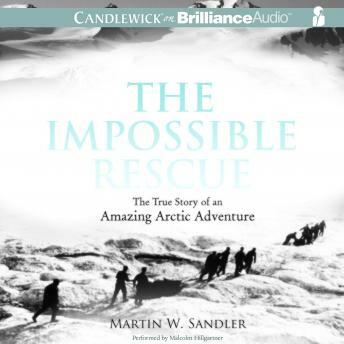 Martin Sandler tells the incredible true adventure story of three men who were ordered by President McKinley to carry out an overland rescue that covered 1,500 miles of treacherous Alaskan terrain in the dead of winter. Their mission was to drive two herds of reindeer the distance to feed the starving men. With their own survival in the balance, these men battled raging storms, killing cold, injured sled dogs, and their own will to continue to bring relief to the stranded whale men. Entries from the journals of two of the rescuers and photographs taken by the third key member of the unlikely expedition dramatically document every mile of their heroic, unprecedented journey.